raita recipe collection. 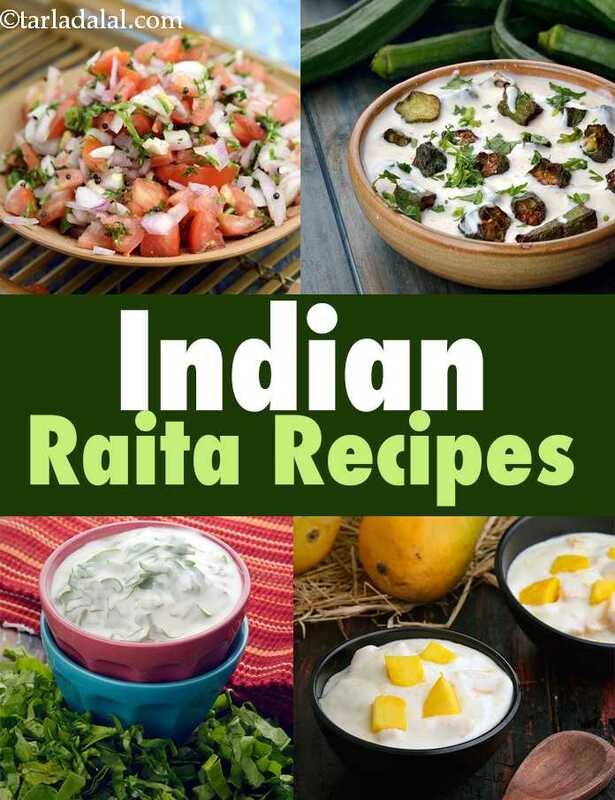 Indian raita recipes. Raita and Kachumber are the desi route to including salads in everyday meals. Raitas are made by combining fruits or veggies with curd, while kachumber are veggie combos perked up with green chillies, coriander, coconut and sometimes a tempering too. The curd improves the nutritional quotient by helping you get protein and calcium, along with the nutritional benefits of the veggies. Enhance your meal with uplifting treats like the Cabbage Kachumber, Fresh Fruit Raita or Mint Raita. While it’s a debate about whether to use low-fat curd or full-fat curd to make a raita healthy, we have a very simple logic. If you are overweight or diabetic, then opt for low-fat curd and if you are looking for ways to consume good fats then full-fat curd is what you must use. Also, make sure you don’t toss in foods with a high glycemic index like sugar, potatoes, etc. Simply combine fiber rich spinach with ingredients like mixed sprouts, spices or onions and tomatoes to make an array of healthy accompaniments like Palak Raita with Onions and Tomatoes, Spinach and Mixed Sprouts Raita or Spinach Raita, for Weight Loss and Athletes. Flax Seed Raita is a unique way of incorporating flax seeds, rich sources of omega 3 fatty acids. Lauki Aur Phudine ka Raita is an easy but elegant recipe that brings together the mellow tang of curds with the pleasing flavor of lauki and mint leaves. Apart from this you can use a myriad of vegetables and make a wide range of vegetable salads. A dash of spices like jeera powder, black salt, red chili powder and a sprinkle of coriander is enough to enhance the flavor. With the help of seasonal fruit, you can whip up delightful raitas like Mango Raita, Strawberry and Black Grape Raita or the Jamun Raita. Choose ripe yet firm fruits so that you get a nice sweet flavour and are also able to chop it properly. Make sure you keep the raita refrigerated till you serve it because it won’t taste good if the curd becomes watery and sour. On daily basis, you can toss and make Banana Raita or Pineapple Raita, a sweet and sour delight which is very easy to make. You can serve them with your meal or piping hot parathas and Biryani. Glance through our collection of top 10 raita recipes and jazz up your meal with our fabulous raita recipes. Serve raitas with Butter Naan, Lachha Paratha, Aloo Paratha, Paneer Paratha. Enjoy our raita recipe collection and salad recipe articles below. Cucumber is mixed and matched with a wide selection of fruits, to make this sweet and sour delight. A slightly different spicing—of mustard powder and cumin seeds powder is used to pep up the fruit and vegetable raita. Remember to chop the bananas and apples just before mixing to avoid blackening.